Yeah he gives it his all, Cole style. He's just gotta watch the silly cards, he seems to get too emotional. I'm sure popas had a word. I'd rather a player wearing his heart on his sleeve and giving his all than a esfc player. 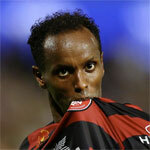 Couldnt agree more, Hersi is a gun, we need to make sure he Re-Signs with Wanderers!! i hear Hersi and Polenz are really good friends, hopefully thats incentive for another years signing? I hope Hersi is in the next batch of players the club resigns. He adds a lot of skill and guile to a right sided attack and works real well with Polenz. Yes, my bad "re-signs" is what I meant. I loved his "backpass" in the Wellington game. Well done Youssouf today against the Roar! Scored an excellent goal and worked tirelessly throughout the game as usual! Hersi has definitely been our best player this season, his run from the back, down the flanks with the ball and having the ability and confidence to finish it off with the goal is something that I havent seen an a player in the A-League do. sign him up popa no more waiting!!! what a player - he is ripping it apart right now! I think its awesome that a journeyman footballer like Hersi who has had his fair share of problems and injuries. He has finally found his feet and a settled club where he can thrive and get the best out of himself. I hope he can stay for a few seasons more because he gives everything for the club. One small negative was when he tried to lash out while he was on the ground, I think it might have been against Djite but I cant remember. It amounted to nothing, but he needs to get that out of his game asap. Hurry up and give Van Hersi a new contract! Hersi signed a new contract today for next season. Well done Champ.............he sums up it beautifully in this article. GREAT NEWS. Signed a new contract well deserved, we love you Hersi. I know he's 30. But i reckon with his lengthy injury and our shorter seasons he could potentially have another year or 2 in him on top of his new contract. Next season we may even see a better player now that he is getting much fitter and his body has grown stronger in recovery. Woohoo, best possible way to start the morning is hearing of his contract extension! Has been one of, if not the, standout player this season. Always a gamble taking on a player after a two year lay off. but he (and the support staff) have obviously worked very hard at getting him back into form. I think we are seeing a glimpse of what he is capable off in the last few weeks. absolutely tearing it up. His pressure on the opposition back line is second to none. His combination work with bridge has improved greatly in recent weeks, hopefully we'll see a similar improvement in the way he plays with kresinger too. If that can happen our attack will be unstoppable. I love how he always credits the fans as a source of motivation. After the heart game he said the crowd was the 11th player after polenz was sent off and then again in the article above...lots of love for the supporters. So keep up the good work guys and we'll see hersi continue his good work. Very happy that he re-signed. Definitely been one of the standout players of the team and league.